Author’s Note: This is a creative enterprise system that integrates an inland waterways system with other transport systems in solving the dilemma of fast-growing populations in the Third World. But is this practical, useful and low cost over enough years to justify the upfront costs. Especially, when engineering fees and other soft costs grow at exponential rates. Generally unaccounted for in government projects, professionals may be required to provide professional errors and omissions policies. How large will the premiums on such policies be to cover the unknown risks and damages of new, untested systems that may be faulty or defective in the public sector? This entry was posted in Uncategorized and tagged boats, connectivity, cruise, ferry, Goa, inter-city, intra-city, Mobility, Movement, tourism, Waterways on February 28, 2015 by Florida's Big Dig. In 1888, Florida canal company general manager George F. Miles engaged acclaimed Chicago waterway and railway engineer Elmer Corthell to survey the soil, rock, sand, and other material the Company dredges would likely encounter in completing the waterway and to estimate the cost of completion. In turn, Corthell employed a former Army engineer, Artur [sic] Wrotnowski, to perform the actual on-the-ground measurements between bodies of water, their depths, and distances, with calculations of how much material the Florida canal company would have to move to comply with state requirements. 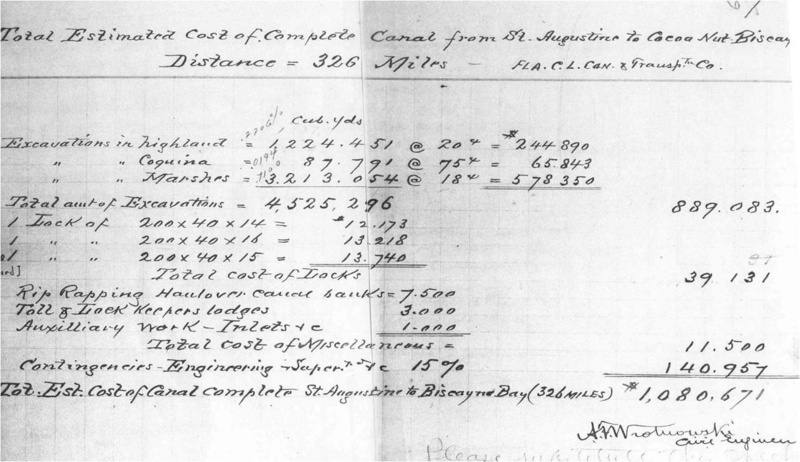 Corthell reviewed Wrotnowski’s survey in detail and reported to the directors of the Florida canal company the amount of material to be moved and the cost to complete the waterway. Corthell also considered mounting marine vessels on railway cars to transit difficult-to-dredge dry land between waterways but rejected the railway alternative as too expensive to maintain. In conclusion, Corthell endorsed the project on a ‘pay as you go’ basis, starting with minimum depths now, using the waterway to generate revenue to dredge a deeper and wider waterway later. Withal, Corthell thought the Florida East Coast economy robust, more than enough to justify his estimated cost to complete of a little over $1 million in 1889 ($26 million in historic standard-of-living dollars today, 2014). Courtesy, Brown University, Hay Library, Providence, Rhode Island. This entry was posted in Atlantic Intracoastal Waterway, dredging, economy, Florida Coast Line Canal and Transportation Company, Florida East Coast Canal, Florida history, Miami, Saint Augustine, Transportation history, United States Army Corps of Engineers, Waterway History and tagged Atlantic Intracoastal Waterway, dredges, dredging, Elmer L. Corthel., Elmer L. Corthell, Florida Coast Line Canal and Transportation Company, Florida InLand, George F. Miles, George L. Bradley, inland waterways, railroads, railway history, Rhode Island, Rockledge, s, St. Augustine, surveys, U.S. Army Corps of Engineers, Waterway history, Waterways on August 23, 2014 by Florida's Big Dig. Plans to deepen the waterway in Broward and Palm Beach counties threaten sea grass, Deerfield Island Park and Palm Beach County. Deepening the waterway and its estuaries to attract mega yacht business potentially threatens the environment. http://touch.sun-sentinel.com/#story/fl-megayacht-dredge-20131215/. This entry was posted in Atlantic Intracoastal Waterway, Dania Cut-off Canal, dredging, economy, Fort Lauderdale Beach and tagged dredging, environment, inland waterways, megayachts, Waterways on December 29, 2013 by Florida's Big Dig. Dr. John Diament Westcott (1807-1889) served as president of the Florida canal company from 1881 until his death in 1889. Born in New Jersey, Westcott briefly attended West Point before leaving for medical reasons. For a time, he also attended medical school in Philadelphia before relocating to the Territory of Florida, serving as secretary to his older brother, James Westcott, the Territory’s first Secretary of State. Westcott soon became proficient in medicine, chemistry, mineralogy, and surveying. As a surveyor, Westcott became Surveyor General in charge of surveying the federal lands of the new State of Florida in 1850. Westcott’s knowledge of public lands along the East Coast of Florida when he later became president of the Florida canal company would prove useful in selecting choice state lands for the dredging work his company was to perform in the years ahead. Courtesy, Museum of the Confederacy, Richmond, Va. 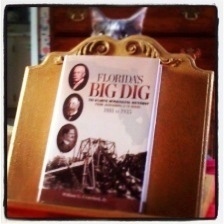 In this first comprehensive study of the Florida section of the Atlantic Intracoastal Waterway, I trace the roots of the waterway all the way back to the Founding Fathers, through the history of the Canal Era and its difficult path in Congress and in Florida’s young legislature as one of the early public-private partnerships, drawing upon early records and land deeds, and tracking the history of the men who made it a reality.